The shape of things to come…..? Consciousness of Sheep keeps coming up with magnificent articles, like this one….. I know I keep saying this too, but the Matrix can’t continue lurching about for too much longer…. 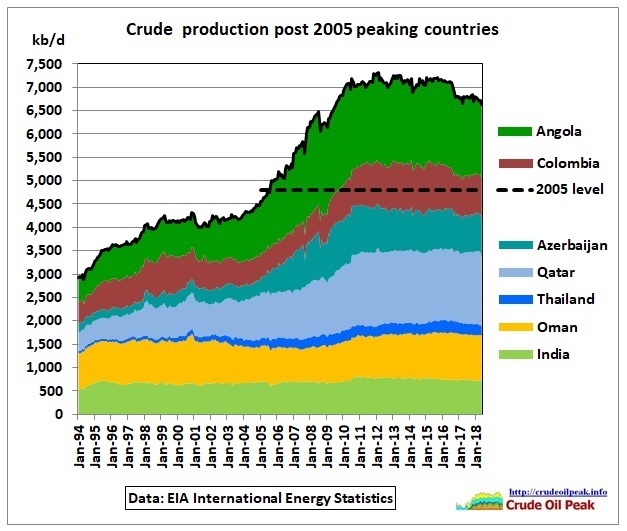 What’s happened to Peak Oil since Peak Oil…. 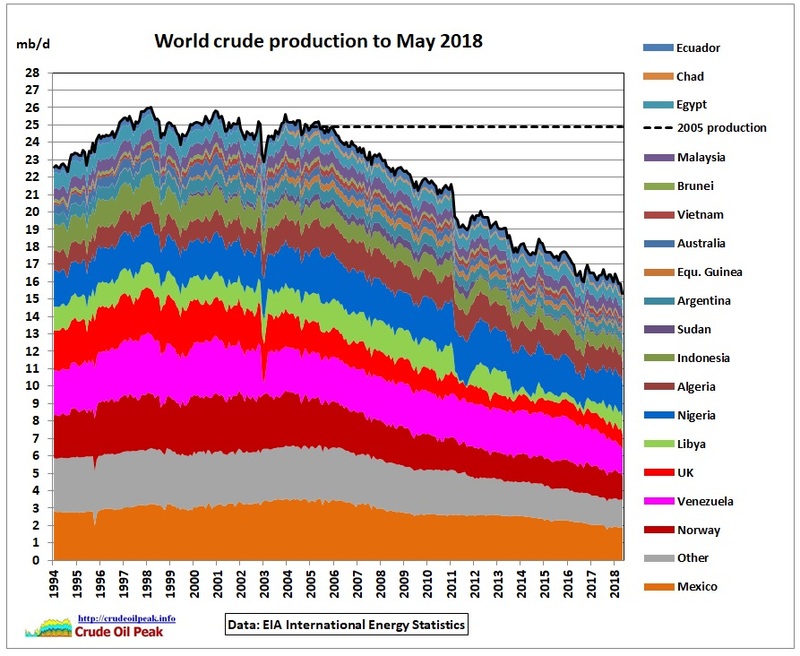 The latest news that Mexico has this month switched from being a net oil exporter to a net oil importer prompted me to do some more research on what stage we all are with Peak Oil……. and as expected, the news are not good. 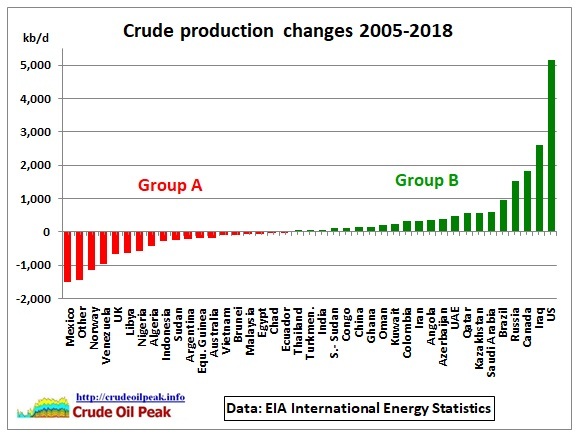 Since the peak of conventional oil in 2005, ALL the major producing nations except for Iraq and the US have been producing less and less in real terms, and let’s face it, half the US’ production is unviable shale oil which since the GFC has lost the oil industry $280 billion and counting….. Meanwhile, pundits on TV are expressing disbelief at how the price of fuel is skyrocketing in Australia (with our dollar struggling to remain above $US0.70) while oil is simultaneously surging under all sorts of pressures. Countries where average oil production Jan-May 2018 was lower than the average in 2005. At the bottom is Mexico with the highest rate of decline. This group started to peak in 1997, entering a long bumpy production plateau at around 25 mb/d, ending – you guessed it – in 2005. This is down now to 16 mb/d, a decline of 700 kb/d pa (-2.8% pa). Countries where average oil production Jan-May 2018 was higher than the average in 2005. At the top of the stack are Iraq and the US, where growth was highest. Group B compensated for the decline in group A and provided for growth above the red dashed line in Fig 1. The 2018 data have not been seasonally adjusted. A production plateau above 7 mb/d lasted for 6 years between 2010 and 2016. The average was 7.1 mb/d, around +1.8 mb/d higher than in 2005. Another country in this subgroup is China, here shown separately because of its importance and consequences. This is a cumulative curve of Fig 2 with changes in ascending order (from negative to positive). On the left, declining production from group A adds up to -9 mb/d (column at Ecuador). Then moving to the right, countries with growing production reduce the cumulative (still negative) until the system is in balance (column at Canada). Only Iraq and the US provide for growth. To top it off, here’s a video clip of this guy I’ve never heard of before but which, whilst not peak oil specific, seems on the money to me……. Certain areas of the world are more vulnerable to economic and societal collapse. While most analysts gauge the strength or weakness of an economy based on its outstanding debt or debt to GDP ratio, there is another factor that is a much better indicator. To understand which areas and regions of the world that will suffer a larger degree of collapse than others, we need to look at their energy dynamics. Now, that we understand the energy dynamics shown in the chart above, the basic rule of thumb is that the areas in the world that are more vulnerable to collapse are those with the highest amount of net oil imports. Of course, it is true that the Middle Eastern or African countries with significant oil exports can suffer a collapse due to geopolitics and civil wars (example, Iraq, and Libya), but this was not a result of domestic oil supply and demand forces. Rather the collapse of Iraq and Libya can be blamed on certain superpowers’ desire to control the oil market as they are strategic net oil importers. We must remember, a great deal of the economic infrastructure (Skyscrapers, commercial buildings, retail stores, roads, equipment, buses, trucks, automobiles, etc etc.) only function if a lot of oil continually runs throughout the system. Once the oil supply falls to a certain level, then the economic system disintegrates. If the oil price shoots up to $100 or higher and stays there (which I highly doubt), then costs will start to surge once again for the shale oil industry. As costs increase, we can kiss goodbye the notion of higher shale oil profits. But as I mentioned in the brackets, I don’t see the oil price jumping to $100 and staying there. Yes, we could see an oil price spike, but not a long-term sustained price as the current economic cycle is getting ready to roll over. And with it, we are going to experience one hell of a deflationary collapse. This will take the oil price closer to $30 than $100. The beginning of the end for the USA?